As a woman who was born and raised in Virginia, my head has been spinning from all that’s been going on. Normally, happenings with our state leaders don’t make national or international news, but we’re not so lucky right now. On the first day of Black History Month, we found out that our governor may have been depicted in black face or in a Ku Klux Klan hood in his medical school yearbook. Shortly thereafter, we found out that our lieutenant governor has been accused of sexual assault. Then to round it all out, our attorney general admitted to dressing as rapper in black face with friends in college. I think it goes without saying, but this has been shocking, and invites questions about who should be in leadership of our state. I’m not here to say what I think should happen with our leaders, BUT I do want to take a moment to say thank you to my friends who have been speaking up against racism after these disappointing and embarrassing revelations. Despite many speaking out against racism, I’ve heard people say that they are shocked by the recent events. Personally, I was initially stunned that this was occuring in the 1980s, but then again I wasn’t that surprised. I was a child in the 80s who was teased regularly for the color of my skin, the shape of my eyes, and the perceived differences. I remember having many conversations with Erica about her experiences for being teased for the color of her skin. Our shared bond of being the mixed kids at school was something my mother at least understood. As much as there has been progress, racial insensitivity is still a thing. Being left out of the conversations of people of color is not uncommon for us folks of mixed heritage too. As we discern how to move forward, may I ask a favor? 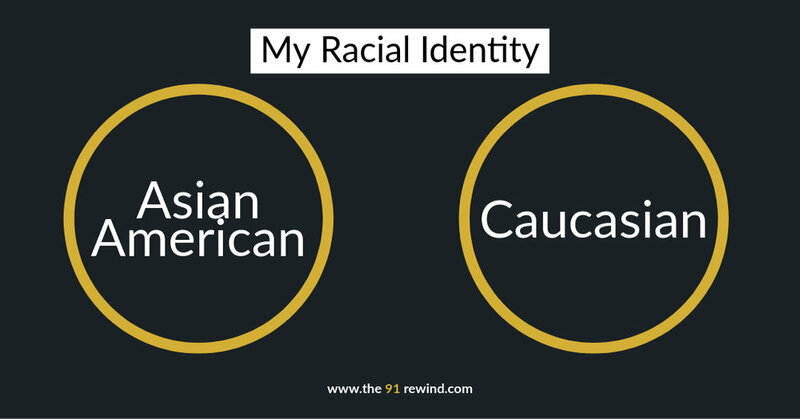 Please don’t forget about the other people of color in your midst, in particular, those who are mixed race. We aren’t enough of one thing or the other to truly belong, so we get left out. Whether our ethnicity is Asian, Native American, African, Indian, whatever, different parts of society do not want to claim us. Some say they “don’t see us as different”, which is a nice thing to hear, I guess. But it is still the exception and not the rule. Both Erica and I have had plenty of people point out our differences over the years. It seems despite it all, we are still different enough. Enough to stand out. To be recognized as the other. We don't quite belong, which leaves us continually sitting on the sidelines struggling with racism, latent and blatant. We want to be part of the conversations that move us forward to a better future. It is thanks to progress that our parents decided to cross the racial divide. We have the benefit of learning from both sides of our cultural and ethnic background, and know that understanding someone who is not quite like you can be a great thing. We know firsthand that teaching our children to be authentic and aware of those who are different is a great thing. After being aware, we begin learning about others that aren’t quite like us and appreciating what makes them unique. Those of us with a different colored skin are in a difficult position. If I speak up about racism and racial inclusivity, I am perceived as a victim or I’m an angry person of color. BUT if other white people speak up, other white people listen. I beg of you not to write me off AND to not write off the prophets of your time. Together we can make this world a better place that is rich in culture, wisdom, and understanding.